One of Modern Family’s more obvious problems this season, and throughout much of the previous one as well, has been finding ways to keep its characters evolving in a way that feels not only true to their former selves, but also to their changing circumstances. All three families are no longer where they once were. They’re lives have changed in numerous ways, even just since last season, and whether your show considers itself a light sitcom or not, the need for character progression remains. More than the reliable structure punctuated by punchlines, it’s what will keep people coming back to the show year after year. Plot doesn’t drive a sitcom; character does. A sitcom doesn’t air for eight seasons because the barely present overarching story is poignant or all that interesting. It stays on the air because a significant number of people enjoy spending some time with the characters. In a sense, that’s escapist entertainment—as much as we can designate one show or movie as more escapist than another, because really, it’s all about escaping. But at the same time, it also means that there are expectations that these characters evolve in some sense. Where Modern Family is struggling with that is clear, as important moments in one’s personal life are used as stand-ins for emotional development. In other words, Modern Family is only exploring a surface-level change in a character’s circumstance rather than digging into how these circumstances change these people. It’s not too much to expect a sitcom to continue to evolve its characters: Cheers, Community, The Office, and New Girl, to name a few, have all done it. 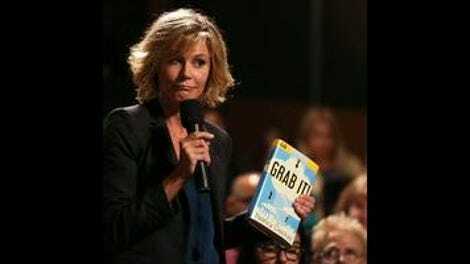 “Grab It” is an episode that embodies a lot of those issues, while also showing a way forward, a way for the show to age a little more gracefully than it’s shown in recent weeks. Take, for instance, Alex. She’s the defining example of the show’s refusal to engage in any actual character work, instead putting her into college and then basically forgetting about her all together. Remember last year when Phil went to her college and instilled in her a sense of bravery and adventure, all in an attempt to encourage his daughter to find herself and her community? That was a meaningful moment because it used the generic plot (Alex goes to college then misses home) to get at something more personal. Then, she stagnated, becoming a minor character with all the same traits as her previous self. So, it’s nice to see “Grab It” give her a storyline that feels rooted in that previous growth. Here, she’s drawn to a Lean In-style book called Grab It! that inspires her to explore taking some business courses. The episode beautifully interweaves Claire’s own character arc into this story as well. She sees Alex drawn to this woman and is jealous, as she believes she’s essentially the same person: a woman CEO who also raises a family. What’s encouraging here is that Modern Family doesn’t take the typical route with Claire. Rather than blow up, she retreats, and then finds solace in some words from Gloria. Gloria tells her, in so many words, that being a parent means not getting the credit you deserve but understanding that your influence is felt. So, when Alex unknowingly takes Claire’s advice and gets a job, Claire can take comfort in the fact that her presence is making a difference in her child’s life. The rest of the episode doesn’t quite live up to the standards of the Claire-Alex plot. Where Claire and Alex were given space and conflict that allowed them to explore a new dynamic, Phil and Jay are stuck in the same storyline week after week. This week, Phil manages to convince his reluctant father-in-law to sponsor him at his country club, where Luke also now has a job. Jay assumes Phil will crash and burn with these types of guys, but he ends up being a surprise hit. But after getting locked in a sauna and having Jay spill his guts to him about how he doesn’t have any place of his own anymore—the plight of the rich old white man really never ends—Phil decides to forfeit his position. The main problem here is that this plot is just another iteration of a story we’ve see 100 times over with Jay and Phil. It’s another look at how Jay underestimates Phil, only to then find some common ground by the end of the episode. You can only see this story played out so many time before you become numb to it. As is often with case with Modern Family, the third and fourth plots are much more frivolous; there’s always one or two that have to take a back seat to the others. Thankfully, there doesn’t seem to be anything too inspired in these tossed-off stories, nothing worthy of more screentime. Rather, Gloria, much like Jay, is subjected to a night of not getting to be alone after Joe downs an espresso and Manny wallows in self-pity—didn’t he just attend a party and maybe find someone to connect with? Why does none of this matter from one week to the next? Then, Cam tricks Mitchell into attending an interactive theater night, leaning into one of TVs more infuriating presumptions: that the viewer will find something funny about intentionally bad art. TV shows do this all the time—You’re The Worst‘s improv subplot comes to mind immediately—and it almost never works. Rather than laughing at the ridiculousness of it all, we’re left cringing along with everyone else. It doesn’t make for funny or compelling TV, and it looks even sillier when stacked alongside the episode’s more emotionally rewarding plots. I wish the jobs of the Dunphy kids were more defined. So Haley seems to be doing well with her club promoting, but she’s also borrowing money from Luke? Also, Luke has a job and it involves him being really good at memorizing things? What is this bizarro world? The gag where Phil fails miserably while performing his magic tricks, only to then accidentally swipe a tablecloth out from under a fully-stacked table, was delightful. Wanting to “Netflix and Mom” is a supremely creepy statement, Manny. Another solid comedic bit: Mitchell’s continually rising exasperation at the predictable melodrama of the play.